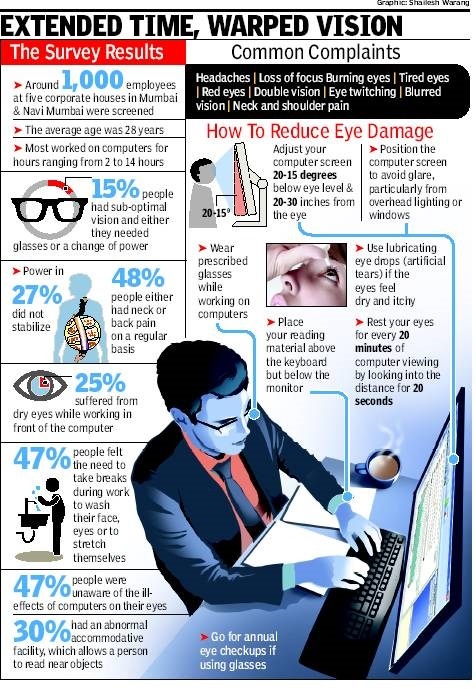 Mumbai: Staring at computer screens for long is harmful for health, but a new survey shows just how widespread eye problems are in the city. Corporate employees whose job profile entails sitting hunched in front of the computer are, predictably, the worst-hit. While 25% of private sector employees surveyed suffered from dry eyes, another 15% had fluctuating vision and 30% had low accommodative power, which is the ability of the eye to adjust itself to read from close quarters as well. Moreover, every second person was unaware about the need to take a break from the screen every 20 minutes or so. An equal number never connected their recurring back and neck pain to vision problems, said the survey. Computer vision syndrome The survey was done by Dr Vandana Jain, a Harvard University-trained eye surgeon, who wanted to find the incidence of eye diseases due to computerization—better known as computer vision syndrome. “At my hospital in Sanpada, I have seen many youngsters, most in their first jobs, coming with fatigue and double vision. This prompted the survey,’’ she said. As part of the survey, doctors from her hospital, Advanced Eye Hospital & Institute (AEHI) in Sanpada, screened 956 corporate employees working five corporate houses located between Powai and Belapur. The average age was 28 years and the average time spent in front of the screen was eight hours. Experts say that computerrelated vision problems are more common than people realise. Dr T P Lahane, wellknown eye surgeon and dean of the state government-run JJ Group of Hospital said, “We have seen people as young as 20 who have computer vision syndrome due to spending over eights hours a day in front of the computers. What worsens their eye power is that when not in front of the computer, they still are busy with their smart phones and tablets.’’ These youngsters initially develop dry eyes that can worsen to chronic conjunctivitis, a condition in which the eye is permanently reddish, he added. “While staring at the computer, people don’t blink as often as they are supposed to. The lid movement is low, exposing the eyeball and making it dry,’’ said Dr Lahane, explaining the reason for the high incidence of dry eye syndrome in society. However, Dr Jain said that one of the most worrisome finding is the high incidence of fluctuating vision. Eye power in the human eye gets steady between 18 and 20 years of age. The steadiness only changes when one reaches 40 years of age. But the AEHI study is an eye-opener of sorts. “We saw people in their late twenties and thirties whose vision was still fluctuating. This could be because they spend uninterrupted time in front of computers,’’ said Dr Jain. Another shocking finding was the poor accommodative power in every third employee. “Accommodative power allows people to read near objects and increases risk of eye strain and headache in people spending long hours in front of the computer,’’ she said. She said one should use lubricating drops and not water to soothe eyes.